Happy Wednesday!! It's challenge time at Decorate to Celebrate!! For Challenge #35, we are asking you to create any project to be used as a party decoration (or party supply) for a Halloween Party. Please give her a warm welcome!! What better way to start a party than decorating your front door. 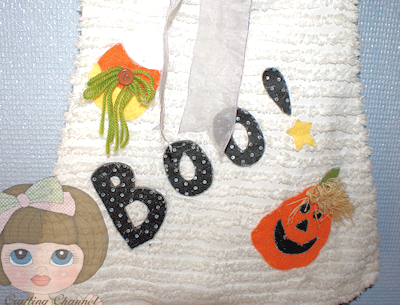 I made this cute little Ghostly Boo Door Decor. He measures 28 inches tall and 18 inches wide. He is too adorable. My grandson will love him. Reminder to link up with our Month long Challenge MCC Challenge #1 - The gh'oul times! OMG! Your door ghost is simply adorable, I love it. TFS! Your ghost is so adorable! You did a great job! This is so cute I just love it--- It could be a fun costume for a little one. Nana, this is so cute!! I love his face!! OMG! Nana this is just so darn CUTE and yes, your grandson will LOVE it! Another fantastic project! Thank you for stopping by and have a fabulous day!! Love it and so will your grandson! that looks great! wonderful job! love your little ghostie! so cute! This is fabulous Nana, I love it and I know your Grandson will. this is way too adorable and cute love it. Adorable door decor! He is going to love it:) TFS! Love this sweet ghost. Can you share the pattern with us?? So cute!! This is so cute! I want to make one too! OMG this is just so super adorable!! Love it! Love this Nana!!! It is so cute! OMG he is sooooo awesome Nana!! I love love love this! What a great home decor project that is sure to please everyone when they come to your door!! This is just too cute. Love it. Your CREATIVITY, yes with Caps...is Absolutely Amazing!I believe that this is what you do...You craft in your sleep,right?You know what I mean!I am guilty of this...LOL..Where would you get this idea!! Its so STINKIN CUTE!..LOL...Oh!and lets not forget his Smiley face.I just want to grab him and hug him! WOW This SOOOO Super cute !! Oh my goodness! This is just the cutest thing ever! I want one for my kitchen!!!! Oh wow, this is so fabulous!! I absolutely LOVE it!! If I could sew at all, I would scraplift this idea!! You did such an awesome job!! It is the cutest decoration ever!! 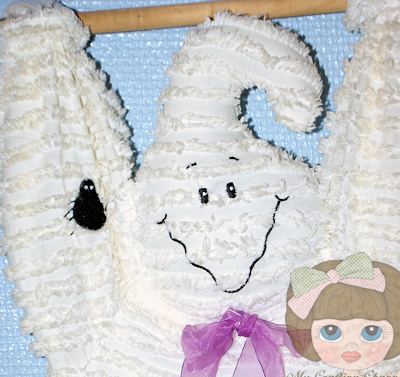 Super cute ghost.love the texture and embellishments.Perfect decoration. I love, love this!! Your ghost it so stinken adorable and what a perfect Halloween door decoration:) TFS! this is soo stinkin' cute and creative I can't stand it! 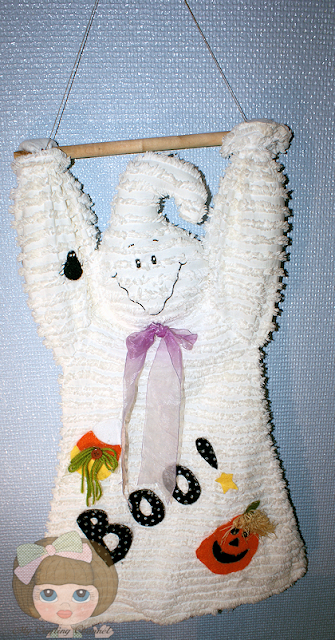 I love ghosts and snowmen, so you have me totally inspired with this project!